Yesterday we had a beautiful day. Friends came over to can some green beans. We had an excellent time. We all came together with shared food and enjoyed a beautiful feast of fresh watermelon, peach cobbler, egg salad, sun-gold tomatoes, cucumbers, kale, lacto-fermented carrots, and all sorts of pickled goodness! Pickled beets, cucumbers, garlic, okra, green tomatoes. YUM! It was a wonderful spread. I decided that morning I would make a pizza. Not even realizing what all we had to share. So great to have likeminded friends. It is a treat. So I whipped up our favorite homemade pizza. Mix flour, sugar, yeast and salt. Add water and oil. Mix well. 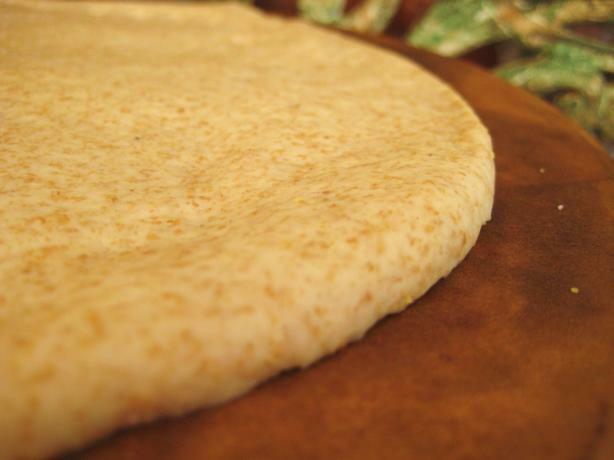 Roll out into pizza crust, making it as thin or thick as you wish.